Cardiovascular pharmacology focuses on the fundamental mechanisms of cardiovascular cells and how drugs influence the heart and vascular system. Researchers in the department exploit novel technologies such as induced pluripotent stem cells, automated electrophysiology and genomics to investigate the causes of sudden cardiac death, congenital arrhythmias and cardiac toxicity of chemotherapeutic drugs. Minoli Perera, PharmD, PhD, associate professor of Pharmacology, studies African American pharmacogenomics, which is the study of an individual’s genome to predict how they will respond to drugs. 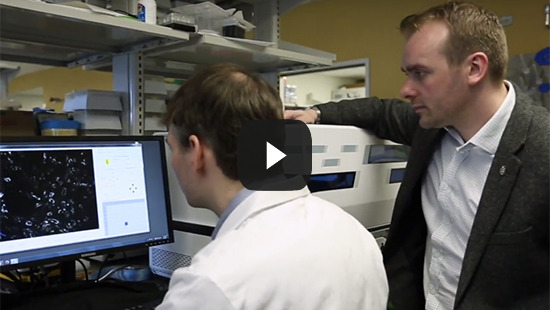 Paul Burridge, PhD, assistant professor of Pharmacology, studies how a patient’s genetics cause negative responses such as cardiotoxicity to chemotherapy agents. The Perera laboratory focuses on pharmacogenomics (using a patient's genome to predict drug response) in minority populations. Working in this translation research space requires both clinical expertise as well as the use of high-throughput basic science approaches. Our goal is to bring the benefits of precision medicine to all US populations. The Perera lab has recruited patient populations from around the world. The data collection includes genomic (DNA), transcriptomic (mRNA), pharmacokinetic and clinical data. We then integrate these different data sources to understand genetic drivers of drug response (e.g. genetic predictors of adverse events) as well as disease. By studying minority populations the lab has discovered genetic risk variants that may benefit the implementation of precision medicine in African Americans and others. We recently discovered a genetic variant that predispose African Americans to bleeding complications while on anticoagulant drugs. These bleeds occurred even when the patient was within the therapeutic window for the medication. We hope that this new data will help to identify high risk individuals prior to therapy. We discovered a new genetic variant associated with a 2.5 fold increase in risk of developing a blood clot. We went on to show that this SNP significantly affects the expression of a key protein in the coagulation cascade. View article on PubMed. Read press release. We tested the association of a SNP, previously shown to effect gene expression CYP2C9, for association with warfarin drug clearance (pharmacokinetics). This SNP increased the expression of CYP2C9 (enzyme that metabolized warfarin), hence causing fast clearance of the drug. This African American-specific SNP may help to explain the higher warfarin dose required by African Americans in general. View article on PubMed. We are using African America primary hepatocytes to understand the genetic regulation of drug metabolizing enzymes that are involved in a majority of drug used in the US. We are conducting several genetic association studies to understand both the genetic drivers and the biological mechanisms behind response and adverse effect to anticoagulant medications. We are investigating the genetic predictors of primary non-response to biologic therapies used in inflammatory bowel disease. Studies have implication for other autoimmune disorders that target the same pathways. We are involved in analyzing the GWAS and sequencing data specifically for genomics variation affect key pharmacogenomics gene in African Americans. For lab information and more, see Dr. Perera's faculty profile and lab website. See Dr. Perera's publications on PubMed. Contact Dr. Perera at 312-503-6188 or the lab at 312-503-4119. The Wilsbacher Lab investigates the roles of G protein-coupled receptors in heart development and disease. Dr. Wilsbacher's research focuses on cardiac development and cardiomyocyte maintenance in the setting of pathological stress. Currently, the laboratory investigates the G protein-coupled receptor sphingosine-1-phosphate receptor 1 (S1P1) and its unexpected role in cardiomyocyte proliferation and cardiac development. Dr. Wilsbacher’s research aims to identify the signaling mechanisms that underlie these cardiac developmental effects and their potential roles in congenital heart disease. In addition, the laboratory explores whether and how S1P1 signaling contributes to cardiac remodeling in the adult heart, particularly in the setting of cardiac fibrosis. For more information, visit Dr. Wilsbacher's faculty profile or visit the Lisa Wilsbacher Lab Site. Contact Dr. Wilsbacher at 312-503-6880 or the Wilsbacher Lab at 312-503-5309.